On May 26, 2010, I received an email from the editor of Pacific Affairs who invited me to review a new book titled The Appearances of Memory: Mnemonic Practices of Architecture and Urban Form in Indonesia. It's my pleasure to accept the invitation and about a week later I received the book and started reading it. While I was preparing the review of the book, I received similar email from the reviews editor of Planning Theory and I respectfully declined the invitation because I had agreed to review the book for Pacific Affairs. The book was written by Professor Abidin Kusno, an Associate Professor at the Institute of Asian Research and the Canada Research Chair in Asian Urbanism and Culture at the University of British Columbia in Vancouver, Canada. The review of The Appearances of Memory: Mnemonic Practices of Architecture and Urban Form in Indonesia has been published in Pacific Affairs 84(2): 399-401 in June 2011. I am pleased to share my review of this book in this blog as you can find below. Indonesia, with a population of over 230 million making it the fourth-largest country in the world, has been experiencing rapid urbanization in the last two decades. This in turn has led to problems in various aspects of urban life in Indonesia, exacerbated by the economic crisis in 1997. The resignation of President Suharto in May 1998, following his failure to address the impact of the economic crisis, marked the end of his New Order regime and the beginning of profound social and political transformation in Indonesia, including its cities. The changes in the cities cannot be separated from the history of the country, which underwent a period of colonialism, a period of revolutionary struggle for independence, a period of authoritarian rule under Sukarno’s Guided Democracy and a thirty-two-year authoritarian period under Suharto’s New Order Regime. 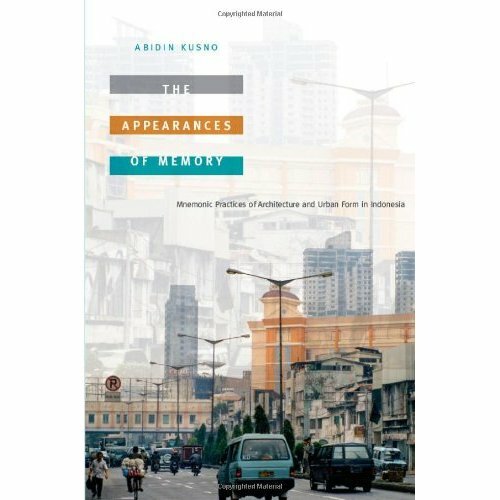 The Appearances of Memory: Mnemonic Practices of Architecture and Urban Form in Indonesia offers new perspectives and interesting analysis of political cultures and the experience of urbanism in Indonesia, providing the reader with a better understanding of the complexity of urban problems in the country. Kusno’s main thesis posits that there have been connections between the built environment and political consciousness in Indonesian cities in the colonial and national periods. The book is organized into four thematic sections: governmentality, remembering and forgetting, reminiscences and mental nebulae. The chapters in the book are organized from the everyday present in the 2000s to the events of the colonial period. Those who are familiar with Kusno’s work will not find much new material in this book. Six out of nine chapters in the book have appeared elsewhere, many of which have been widely cited. the book also amply supplement the narrative. Kusno offers an intriguing analysis of urban issues in Indonesia from the combined disciplines of architecture, history and politics. Such analysis is unique and will contribute significantly to the literature of urban studies, not only in the Indonesian context but on a broader level. In this book, Kusno also coins such terms as nationalist urbanism (26), state modernism (94) and market modernism (94) which could apply to cities in other countries. I found a lot of compelling discussions in the book, particularly those on Jakarta’s visual environments including the busway project, superblocks, kampongs, the street vendors, the preservation of Old Batavia, and the redevelopment of Glodok after the May 1998 riot. Drawing from those visual environments, this book reveals how the visual environments are well connected with the anxieties over the sense of change at different historical moments in Jakarta. Kusno clearly demonstrates the interplay between collective memories and the changing realm of the visual environment in the city. Despite its many virtues, the book does not discuss the most important public visual environment in the city, particularly in Jakarta, which is green areas. As Jakarta’s population grows, its green areas shrink. The population in the city grew from 3.5 million in 1965 to more than 14 million in 2010, but in contrast the green areas have shrunk from 35 percent of Jakarta’s land area in 1965 to only 9.3 percent in 2009. New luxury homes, condominiums, shopping malls, hotels, commercial buildings and offices have proliferated over the last three decades. Many have been built at the expense of green areas. An analysis of the shrinking green areas in Jakarta would be a very compelling additional section to this book. political culture of the Jakarta administration, but fails to analyze the effectiveness of this project in alleviating transportation problems. This book offers an in-depth analysis of mosques and gatehouses during the colonial and postcolonial eras, but does not provide further discussion of Indonesian traditional piazzas (alun-alun) which are a unique component of Indonesian cities. A further analysis of alun-alun in both colonial and national periods would be an excellent additional section to this book. My other regret is the subtitle of this book. The cases in this book were drawn primarily from Jakarta and a few cities in Java. Indonesia is a large country with over 17,000 islands and 300 distinctive ethnic groups, and it should not be represented by only Jakarta and a few cities in the island out of nine chapters in the book have appeared elsewhere, many of which have been widely cited. Blognya sangat bagus K Deden Rukmana bermaafaat sekali buat penataan kota dan permasalahan saya sering follow blognya punya K Deden. Semoga K Deden + Keluarga di Amrik sana selalu Ada dalam lindunganNya.